This is an absolute delight for you and your clients to watch, as the crepe chef makes your personal crepe on the mobile crepe cart. The choice of fillings are prepared in advance from an extensive list. 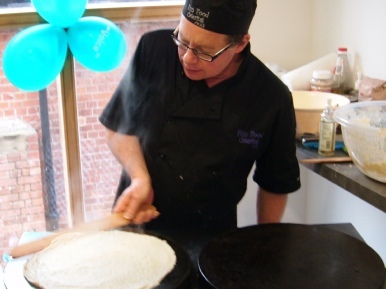 The Crepe Chef will cook, fill and serve a sweet or savoury crepe in just over 2 minutes. 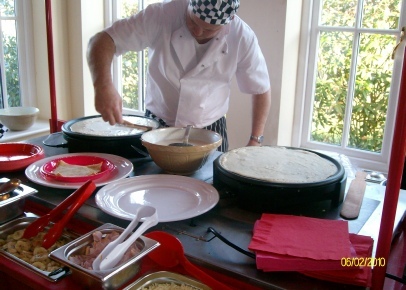 Try our pancake making services and make a great impression on your trade show stand. We guarantee you and your clients will not be disappointed! This crepe making services is a great exhibition stand attraction as an alternative trade show catering idea. 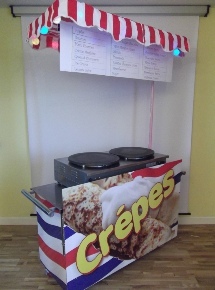 Put this mobile crepe cart on your stand as a different exhibition stand catering experience. We also make Great Waffles! Farnborough International Exhibition & Conference Centre, Chelsea Old Town Hall, Drapers’ Hall, Novotel London West, Coventry Transport Museum, Business Design Centre, Olympia, Bournemouth International Centre, Donington Exhibition Centre, Donington Park, Earls Court, Epsom Downs Racecourse, ExCeL, G-Mex Centre, Hilton Brighton Metropole Hotel, Old Billingsgate, Manchester Central Convention Complex, The Brighton Centre, National Exhibition Centre, Telford International Centre, Queen Elizabeth II Conference Centre, Stoneleigh Park, Ricoh Arena, The Royal Armouries Museum, Cardiff International Arena, Sandown Park Exhibition and Conference Centre, The O2 Arena, Farnham Castle, Alexandra Palace, Warwick Exhibition Centre.